Posted July 10th, 2016 by phelberg & filed under Blog. I won the Pulitzer Prize for short story in May 1975. It’s been a struggle ever since. Where do you go from there? At barely twelve years of age, I didn’t really appreciate that there were a lot more years ahead, and I couldn’t just rest on the laurels Cushing Elementary School had bestowed on me. From my seat in Mr. Flaherty’s sixth grade class, I figured my career was set; I was going to be a famous author. No such luck; any good reader could have seen that one coming. That award-winning piece of suspense fiction is long gone now. It involved falling into a dark place and being chased, only to see the main character wake up and realize they were late for school. Yes, highly suspenseful! 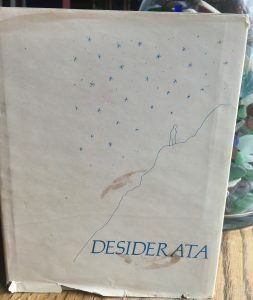 I still have the book that was my prize, Desiderata (a beautiful prose poem, written in 1927, by Max Erhmann), with the inscription: “Dawn, I look forward to reading more from you, in the future. All the best in your writing career, Mrs. Nugent.” Also, this quote from Anatole France: “To accomplish great things, we must not only act, but also dream; not only plan, but also believe.” Mrs. Nugent was the cool teacher, I wished I had; her encouragement meant everything, at the time. I thought she could see my dreams, and so I believed in them. The book sits on my desk, to remind me of where I was headed, before I lost my way. I lost my way in the same manner so many people do: I had limited guidance, and I didn’t understand my own worth. Two years before the Pulitzer, my father was killed in a car accident. My mother took us from him, months before that, and my siblings and I were adrift, trying to make sense of the chaos that adults create. We were surrounded by a new place and family we hadn’t known–– away from the father we adored, and the family and friends who we’d grown up with. It’s no wonder that most of what I wrote in those years was filled with longing, scary images, turmoil, and kids who ultimately won. I needed desperately to feel like I could win something. Writing and painting were my outlets. With art, I could paint an image the way I wanted it to look. Blues could be bluer, and scenery idealized. I filled sketchpads and excelled in art class. However, it was writing that allowed me to explore my inner world. Fiction provided escape, and I wanted to create that magical outlet. So many of the books that I loved had main characters who faced huge obstacles, went on adventures, and triumphed. The Julie of the Wolves trilogy, by Jean Craighead George, and the Lord of the Ring series, by JRR Tolkien were my favorites. I read and re-read them. They gave me hope that even the hardest things could be tackled and overcome. Throughout high school and college I learned that I could write my way through almost any assignment–– even if I hadn’t mastered the subject. For the past ten years, I’ve been a tutor to seniors in high school, working on college essays. Now, I cringe at the same cliché writing I handed in, all those years ago: flowery cover-ups and nuanced repetition, that sugar coats equal parts confusion and bravado. I’m firm, but compassionate when I introduce the idea of “killing one’s babies,” hoping to inspire these young writers, not squash their dreams. I didn’t have writing mentors, after that Pulitzer. My mother moved when I was a junior in high school, and I was busy staying afloat. I was expected to go to college (the first in my family), but no one told me that I could actually be a writer, or what to do. And so, that dream got lost. I got my Masters in Social Work; I worked as a therapist; I had kids, and I spent a lot of years writing on the side–– a hobby. At 53 I’m breathing new life into my dreams. I’m working to get a memoir and a novel published. The blog that I started as a “platform” for publishing, has become a focused outlet for my writing–– no longer a backseat project. That quote by Anatole France looms large these days. I’m working hard to see my dreams come true, and believe that they will. It’s a challenge for this writer, who still struggles with self-worth, in a business that is daunting at best, but I’m determined. I’m not that lost kid any more, waiting for others to inspire or support me, and that feels really good. Still, maybe one day, (a very elderly) Mrs. Nugent will read my work, and smile. 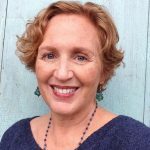 Bio: Dawn Quyle Landau publishes regularly on her blog Tales From the Motherland. She participates in a weekly flash fiction challenge, and writes whatever inspires her on a given day. She is a featured blogger for Huffington Post, where she is paid millions. She is working hard to get two manuscripts published, and will then run away to Iceland… where there are dragons. Thanks for sharing your struggles. I can relate. And congrats on having two finished manuscripts. Thanks Laura! Of course, not much to toot the horn about, until I actually do something with those manuscripts! 😉 Thanks for taking the time to read and comment; it’s much appreciated! I love that you won a Pulitzer! That makes me very happy. Thank you for writing about writing and letting me know where you started and how far you have come. You inspire me every day. Love. Thanks so much Sarah! Yes, those Pulitzers are highly coveted… it’s all down hill from 6th grade! 😉 Thanks so much for your kind words. I so appreciate your support of my writing! Dreams can be illusive. So wonderful when you find the right track and go for it. The work that takes to see it through is worth it. Thanks Janet. You are certainly evidence of all that! I appreciate you encouragement.